It's time that we took back our work day from our calendars and Calendar Tetris is the first thing that has got to go. Calendars are a tool and like every tool they should be used appropriately. Does your calendar look like a Jackson Pollack painting? Maybe more like a Piet Mondrian? Then you're probably suffering from Calendar Tetris. Calendar Tetris is a problem where you constantly have to shuffle around items on your calendar because there's so many of them they can't all fit. When it's particularly bad, you rarely have an open spot on your calendar and you're frequently double-booked. At it's worst, I've seen a coworker triple-booked at minimum every hour of the workday for an entire week. Why is Calendar Tetris a bad thing? Brendan Nelson argues that the constant scheduling of meetings is taking over our lunch hour! And I agree. I feel guilt and just a tinge of shame when I decide to take my full lunch hour (What Nelson calls "white collar truancy"). And nobody has ever told me I'm explicitly not allowed to take it. I'm just used to running out to get whatever's cheap, quick, and delicious and going back to my desk to get some reading done. But the disappearing sacred ritual of a lunch "hour" isn't the only thing that Calendar Tetris is affecting. Constant meetings ruin productivity. And everybody knows it. Ray Williams points out in Psychology Today that managers think that 30% of the meetings that they're in are a waste of time. And that's just the meetings that they know are wasteful! What about the ones that could have been avoided altogether? In another article, Dr. Sally Augustin points out that even small interruptions can cost you. Interruptions of as little as 3 seconds can double the number of cognitive errors you make afterwards and longer interruptions flush your working memory leaving you 15-20 minutes behind in your work. How does one wind up playing Calendar Tetris? A lot of people think that just because they're senior or because they're a manager that they necessarily have to be in meetings all day. I once witnessed a situation where an engineer got a promotion that added the word "Lead" to his title. That engineer suddenly got added to another 6 meetings a week despite having basically the same job description and the exact same responsibilities. You don't need to go to all those meetings though! Take, for example, the CEO of a busy and valuable company. You would assume that they spend all day in meetings in board rooms and drawing on whiteboards but Jason Fried argues that he tries to keep his calendar as open as possible in order to get real work done. In some environments I've worked in people feel they need a lot more structure in the workplace. Those teams tend to call everything a meeting even if it's just a quick conversation. Most often I see Calendar Tetris being played by people who have too much on their plate. They have too many reports, too many responsibilities, or just too much to focus on. In that case, the best solution is to trim down your responsibilities and make an effort to focus on just one problem or project until you finish it. A lot of the trouble with an extreme volume of meetings comes from not using the tools around you correctly. For example, do you need a meeting for an announcement or could you just send a quick email? Do you really need to put time on Sully's calendar or could you just walk over to her desk and ask "Hey, sorry to interrupt, do you remember what we decided to do about all those UFOs?"? And yes, you should always apologize for interrupting people. Meetings are huge interruptions and drag people and their ability to focus far away from real work. What's on your calendar? Does it need to be a formal meeting? The answer for most meetings is a solid "No". For the most part you could send out a quick email, slack message, or just stop by somebody's desk to get them to answer a couple questions. Does somebody need to sign off on the decision? Stop by their desk next! You just saved the whole team half an hour of not being sure why they're in a room with everyone. Anything that doesn't need to be a formal meeting needs to come off your calendar right away. Put things that you need to talk about into a todo list and get them done with relevant people when you get to it. Does the meeting need to be that long? Most meetings go on far longer than they should. A good way to make sure your meetings are as short and productive as possible is to set an agenda (and stick to it!). 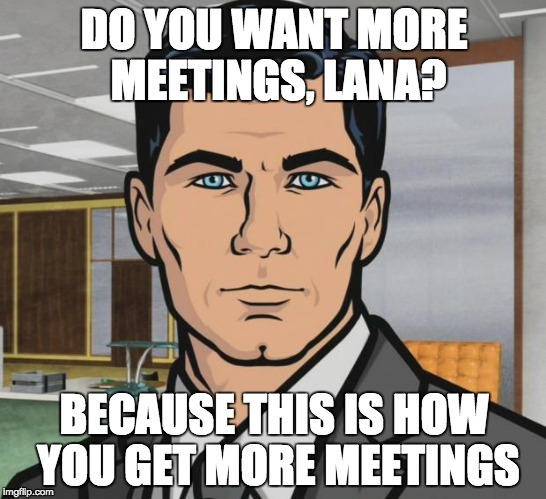 If a coworker sends you a meeting invite with no clear agenda such as one with just a title like "Planning session" or "Let's chat", ask them to add an agenda to the meeting invite. In my experience, if you ask people to do this they tend to realize that they need way less of your time than they thought. More than once I've had somebody cancel a meeting because they realized they didn't need it. Speaking of agendas, agendas are a way of preparing for meetings or whatever's on your calendar. Everyone should always be prepared for whatever the meeting is. If you're going to an IPM, everyone in the room should have scanned the stories you're reviewing before you sit down. If you're having a performance review, everybody involved should have already discussed most of the issues at hand before the official review. If everybody invited isn't prepared then you either need to limit the meeting to the people that did prepare or move the meeting to another time, preferably never. Do you personally really need to be present for that meeting? The answer is frequently "no". Relevant parties are usually just the people that need to make a decision. If somebody is participating just because they're a manager for people in the meeting or because they want to know about the outcome of the meeting, they're not actually contributing. Managers and interested parties who don't need to be part of the decision making process can be filled in later via email or in person. Is your whole team in the meeting for some reason even though Mulder and Skinner are the only people who are going to talk or listen? Everybody else can go then. There's no reason to involve Product Managers outside of your team or junior developers in a conversation about a bug or planning next quarter. And have you guessed the great part about eliminating unnecessary people from the meeting? Once the attendance list is down to just the relevant decision makers, you can usually cancel the meeting and turn it into a quick conversation or brainstorming session over coffee instead of wasting people's time and the company's money. Does that meeting need to be recurring? I can't count the number of times I've seen people walk into a room, announce "we actually have nothing to talk about this week" and walk out again. That was a huge interruption for nothing. Or when I see that people have skipped the meeting smartly but they still have the room reserved which is confusing for people looking for a quiet place to talk. Any time somebody invites you to a recurring meeting, you should be asking them if it's really necessary to plan a second meeting when you haven't even had the first. How do they know you'll need to talk about a particular subject again at exactly that time in 2 weeks? Recurring meetings are generally a good way to waste people's time. The only recurring meetings I think people should have are a morning standup and a weekly/semi-weekly retrospective. Everything else can go. If you have a lot of recurring meetings or just meetings scheduled far ahead in the future, take the opportunity to clean out your calendar once in a while. You can think of it like clearing the candy bar wrappers and coffee mugs off of your desk once a month. Cleaning your calendar is just as good of a use of your time as cleaning anything else you look at so often. And when you can trim out a meeting here, a meeting there, and a couple recurring meetings that you never go to, suddenly you have a lot more free time on your calendar! Suddenly you have time to get real work done instead of go to meetings! How are you addressing takeaways from your meetings? A well-organized meeting should result in at least one decision or action item. That action item should turn into a story in your board or somebody doing some work as soon as possible. The takeaway from a meeting should almost never be just another meeting. If your meetings are just creating more meetings, what did you actually accomplish in the first one? The worst part about going to meetings is that they interrupt what could otherwise be productive work time and it takes a long time to get back in the groove of what you were doing. A very effective way to mitigate that loss is to group your meetings together. This reduces the amount of time that you waste before and after the meetings. Try to group all your meetings into the morning, before you go for lunch. Or block off certain days as pure work days. Say you only take meetings on Monday, Wednesday, and Friday so that you have 2 days a week that can't be interrupted. Imagine how much you can get done with all that meeting-free time! The comparison image above is courtesy of this wonderful article by Acom. Worth a read since it should take about a minute.